One field guide, seven countries. It actually makes a lot of sense, the geographic features of the isthmus between North America (including Mexico, because Mexico is part of North America) and South America cut across political lines, as do birds. Birds of Central America: Belize, Guatemala, Honduras, El Salvador, Nicaragua, Costa Rican, and Panama, just published in October, is a field guide that was ten years in the making. It’s unique in two major ways. It is the first bird field guide to every country of Central America (plus the islands governed by those countries). And, its beautiful illustrations are by a single artist, Dale Dyer–the norm in years past, but a feature that few field guide projects can afford in terms of time and money these days. Covering 1,261 species with data and taxonomy current up to August 2017, the field guide is an exciting achievement. Reviewing it also brought up some questions, which will be explored throughout this review. The Species Accounts section takes up the body of the book, and is arranged taxonomically according to the AOU Check-list of North American Birds, Checklist & Supplements through 2017 (with a small number of exceptions, the Introduction notes). Within families, the species are arranged less taxonomically and more in line with “design and space considerations,” (Introduction), and on the plates themselves, species are arranged to facilitate comparison. Text is on the left, plates are on the right. Each spread (text and plate) is prefaced with the names of the family (common and scientific names, e.g., ‘Parrots Psittacidae’) and a 1-4 line paragraph summarizing common identification features and distribution. These introductory texts become more specific when there are multiple spreads for large bird families, like ‘Gulls Laridae.’ So, we learn that the gulls in one grouping are all rare, and the gulls in another grouping are part of a “large, cosmopolitan group,” that must be identified through studying structure, upper-wing pattern, and head pattern. Each species is described succinctly, starting with common and scientific name and measurements. Helpfully, range for the world, not just Central America, is given at the beginning of the second line of the Description, two-letter abbreviations for the areas where the species is found (ex: CA and north SA, South MX and CA, and I have to add that it took me a minute to realize that CA meant Central America and not California) and a notation if the species is endemic. This is followed by abundance notations, denoting if the bird is abundant, common, uncommon, etc. and where it is most likely to be found–Pacific, Caribbean, specific islands, lowlands, foothills, with altitudes given for the latter. Next are the Identification (ID), Geographic Variation (GV), Habits, and Voice sections. “Identification” details plumage and structural characteristics necessary for identification, with the most important traits italicized. Descriptions are mostly in layman’s language, but occasionally utilize technical terms for bird anatomy, such as ‘retrices’ and ‘auriculars.’ (There is a bird topography page in the Introduction indicating where those parts are found, but the terms are not part of the Glossary in the back of the book.) Similar species are noted. “Geographic Variation,” succinctly describes, with corresponding illustrations, forms that are distinct subspecies and forms that are representative of several subspecies–hence the term ‘geographic variation.’ Not every species has a GV section, and the amount of description allocated in each section varies from a brief notation on color differences (most species) to the uncertainty of how voice variations relates to color morphs (Vermiculated Screech-Owl). I recommend you read the Introduction for the authors’ description of the long process used to determine which geographic variants to describe and illustrate. The “Habit” section covers habitat (from scrub to elfin forest to pelagic waters), social habits (solitary or with a flock), flight style (mostly for hawks), and other behaviors (foraging or probing behavior, whether or not it follows mixed flocks, skulking behavior). These descriptions are particularly good for antbirds and related species. “Voice” includes descriptions and transcriptions of calls and other vocalizations, with notes of similar calls. At any rate, this is a relatively serious error since Turquoise-browed Motmot is one of the must-see birds of Central America, and this species account is likely to be consulted by many users. I’m hoping the authors and Princeton University will add a corrected page to their website that users can download, or, even better, add an errata page to all books currently being sold (I know that’s an expensive proposition). I’ve done a random check of other species accounts and can’t find any other errors (which isn’t to say that some won’t be spotted, I know that’s a hobby of some field guide enthusiasts, and when a book is composed of tens of thousands of tiny specific details it’s hard not to have an error or two or three, and I can’t imagine fact checking a field guide and staying sane). A field guide is a portrait of the biodiversity of a region. When the illustrations are designed well, and combined with accurate range maps, biogeographic patterns emerge with special clarity. Thorough review of bird specimens from across Central America, as well as a review of ornithological literature, is what gives me an understanding of what needs to be said, and inspires me to get to the drawing board. The only way to study geographic variation in a species is by placing specimens from far apart places side by side. A great collection like that at the AMNH gives one an opportunity to study species and species relationships in a way that watching birds in the field cannot. Nevertheless, it necessary to combine field experience with museum experience to create a vivid and accurate image of a species. You can get a sense of how many specimens Dyer studied by the number of institutions used to obtain specimens listed in the Acknowledgments section, as well as the list of ornithologists, bird illustrators, and others who shared photographs and unpublished information. The images are large and carefully drawn, with page backgrounds of varying shades of brown and gray. And, they are simply beautiful. Great care has been taken to portray the feather texture and tones of color of each species, employing, I assume, watercolor/gouache method used in his other work. Wood-quail are drawn pausing on brown leaves. Passerines are shown perched on a branch or tree in a representative posture, Treerunners gripping their branches upside-down, Woodcreepers almost vertical on their trees. There are some ‘behavioral vignettes’–a Sunbittern displaying its colors, a Montezuma Oropenola nesting colony–and I wish there had been space for more. The plates can be quite crowded or splendidly spacious, depending on the number of species being portrayed (six at the most, but usually three or four). I’ve uploaded a number of plate images to give you an idea of the quality of the art and the choices that were made in plumage and posture. Images of each species are grouped together, with the brightest colored bird, usually the adult male, on the far right, and duller plumages–female and immature–to the left. Geographic variants are placed in arrangements that reflect their geographic relationships, with northern variants on the top, western to the left, and so on. Images on the same plate are drawn to scale, and the scale percentage is indicated on the upper right-hand corner. Exceptions are images of birds in flight and behavioral vignettes, which are smaller. I wish the flight images for the hawks, falcons, parakeets, and parrots were larger. Text is limited to species common name, symbols for male and female, abbreviations for immature and adult, where necessary, and for geographic variations. The authors emphasize in the Introduction that there is great variation in bird plumage, and that they have selected those plumages that are most representative of the species, and which “allow the user to understand the full range of the species’ appearance” (p. 18). I was initially struck by the color tones of the illustrations, especially those of the shorebirds, owls, and some of the hawk and tanager species. I thought they were too light; I continually had the urge to press a computer key to darken the tone, as one does in Photoshop. I contacted Princeton University Press to make sure I hadn’t received an aberrant copy, and they very kindly sent me another volume, noting that the illustrations appeared to match the final files sent to the printer. The color tones were the same as my original copy. I contacted people I knew who had received copies of the book, and they replied that some of the images were a little light, but overall they thought they were accurate. So–was the problem me? Have I gotten too used to avian images on the web that are perhaps a little over-saturated? Am I examining field guides in light that is too dull or too bright? Do I need new glasses? 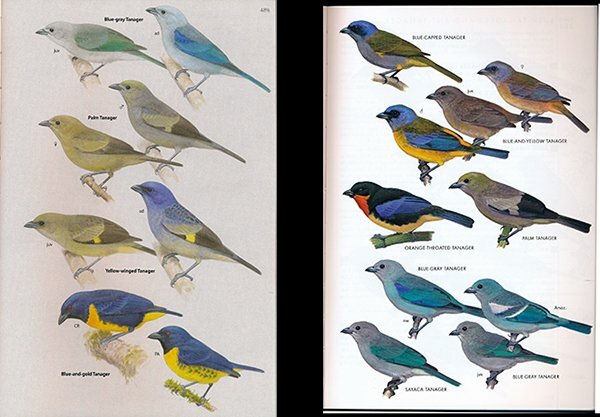 Next, I looked at Blue-gray Tanager as illustrated in two classic field guides: on the left, we have a plate from The Birds of South America, painted by Guy Tudor; on the right, a plate from A Guide to The Birds of Mexico and Northern Central America, painted by Sophie Webb. 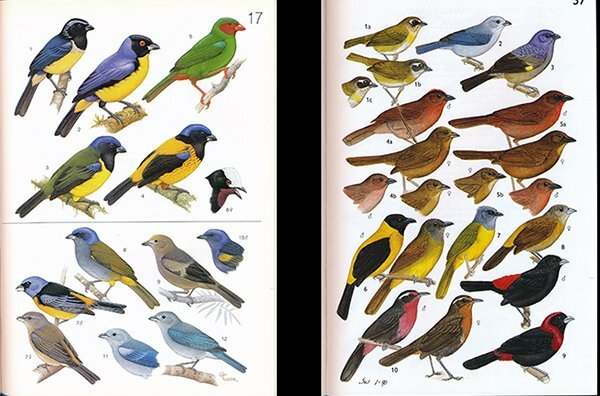 I think it’s pretty easy to pick out Blue-gray Tanager, but, just in case, it’s number 11 in the Tudor illustration (number 12 is the look-alike Sayaca Tanager), and number 2 in the Webb illustration. I need to note that all four pages were scanned with the same scanner and not edited at all, aside from sizing, by Photoshop. So, what do you think? Is the Blue-gray Tanager, as it appears in Birds of Central America, too light? Or, are the tones similar to the birds’ depiction by two masters of Neotropical bird illustration? In this specific case, I have to go with the latter. However, I do think that there are illustrations here that suffer from washed-out blacks and whites that almost blend into the background. 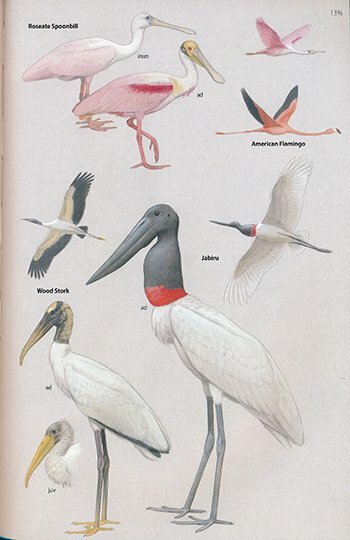 Compare the Jabiru below to the Jabiru in the Sibley Guide to Birds, 2nd ed. (the second run, with the corrected coloring), and you’ll see a bird with a much darker head. The difference in tone is enough to make a marked difference is how we appreciate the bird, one image is mildly interesting, the other image is striking and unique. 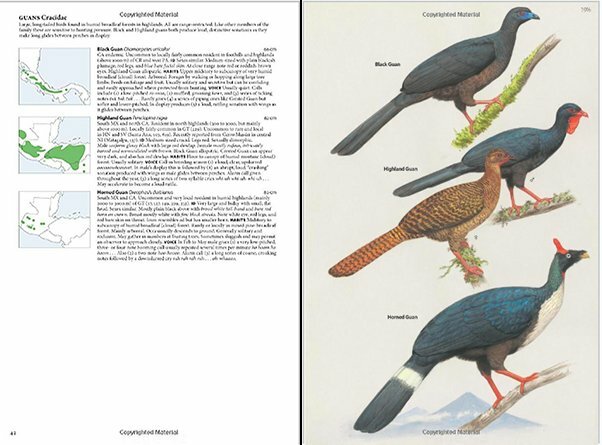 The guide’s Introduction covers the scope and plan of the book, including a diagram of ‘bird topography’ and full descriptions of habitat terms. I wish, as I often do, that the authors had included the story of the development of the book; there are hints in these sections and the Acknowledgments of the hard work, strategic decisions, and many trips involved. There is also a 7-page section on the Geography of Central America, covering the geography of the subregions that largely determine Central America’s distribution of birds and other forms of life. This is well worth reading, as the regional descriptions include endemic and range-restricted species as well as fauna, climate, and recent trends. Back-of-the-Book sections are Marginal, Dubious and Hypothetical Species, Taxonomic Notes, Glossary, Bibliography, and Index. The Marginal section is very brief, citing vagrants that have been reported or collected or photographed once or twice. Readers are referred to articles from the bibliography for more information. The Glossary is also brief, giving definitions of scientific and ornithological terms used in the Introduction and Species Accounts, like “allopatric” and “endemic.” It does not, as I noted above, include bird anatomy terms. The Bibliography lists 677 articles and books, mostly articles, from ornithological literature, a record of the research that went into this volume. 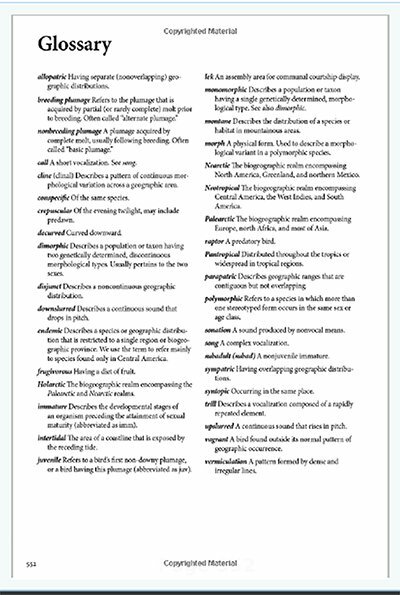 The Index tells us where to find species by scientific and common names, alphabetically, with scientific names italicized. Common names are listed by the major part of the name, followed by descriptor; for example, Flycatcher–Tufted. Both genus names and species names are listed. There is also a Fast Index on the inside of the front and back covers (actually on folded-in extensions of the front and back covers), listing bird families alphabetically. This is very helpful, because if you’re not familiar with the order (what some birders might call the whimsical or capricious order) of the current taxonomic order, and if you don’t know the exact name of the bird you want to look up, then you’re lost. I would have liked even more finding aids, such as a visual index or colored tabs on the edges of the species accounts. WHICH FIELD GUIDE TO USE? This is the first field guide to birds of all the countries of Central America, but there are other field guides to the area and the birder about to travel to one or two of these countries will have some choices to make. First of all, there are the classics, cited in the Introduction as important resources and models for the authors: A Guide to the Birds of Costa Rica by Gary Stiles and Alexander F. Skutch (Cornell Univ. 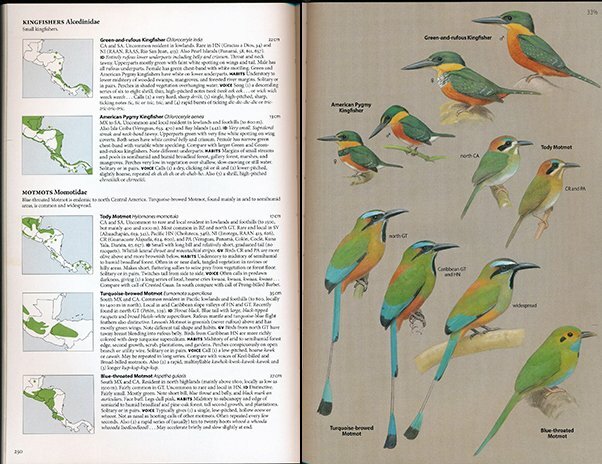 Press, 1989); A Guide to the Birds to the Birds of Panama, with Costa Rica, Nicaragua, and Honduras, 2nd ed., by Robert S. Ridgely and John A. Gwynne (PUP, 1992); and A Guide to the Birds of Mexico and Northern Central America by Steve N. G. Howell and Sophie Webb (Oxford Univ. Press, 1995). These are more reference sources than field guides; the titles are comprehensive, heavy, and, in some cases, multi-volume (though I know many a birder who has lugged Howell & Webb in their suitcase). They are also out-of-date in terms of taxonomy and distribution. There are very good to outstanding country field guides, most notably The Birds of Panama: A Field Guide by George R. Angehr, and Dean, Robert (Cornell Univ. Press, 2010), The Birds of Costa Rica: A Field Guide, 2nd ed.by Richard Garrigues ands Robert Dean (Cornell Univ. Press, 2014); and Guide to the Birds of Honduras by Robert J. Gallardo (2015). Birds of Nicaragua: A Field Guide by Liliana Chavarría-Duriaux, David C Hille, and Robert Dean has recently been published by Cornell Univ. Press and Birds of Belize by H. Lee Jones and Dana Gardner was published by Univ. of Texas Press in 2013 (I haven’t examined either title). There are no bird guides for El Salvador or Guatemala. 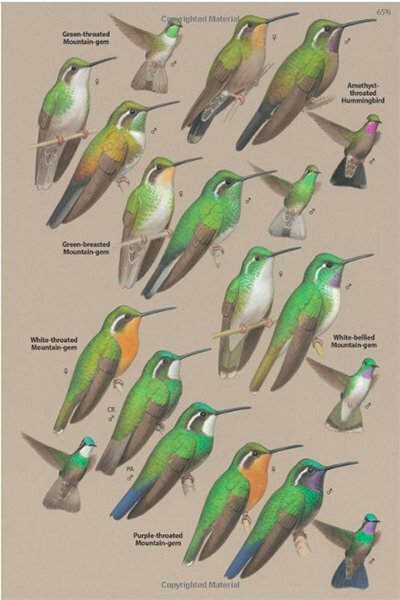 But, there is the excellent Peterson Field Guide to Birds of Northern Central America: Belize, El Salvador, Guatemala, Honduras by Jesse Fagan and Oliver Komar, with illustrations by Robert Dean and Peter Burke, published in 2016. Some features to consider: Birds of Central America is a big book. It weighs 3 pounds and is about half-an-inch less in height and a quarter-on-an-inch wider than the big Sibley’s. It is a field guide that is tough to carry about in the field. The Peterson Field Guide to Birds of Northern Central America is small and light, extremely portable. The country guides that I have used or reviewed–Costa Rica, Panama, Honduras–range in-between these extremes, with Costa Rica being the smallest and lightest and Honduras being almost as large, though not as heavy, as Birds of Central America. I feel like I need to add that Birds of Central America is also available in a Kindle edition, which brings up a whole other type of option! Timeliness of information: Birds of Central America and Peterson are both current, incorporating taxonomic changes of the last few years. Birds of Central America is, of course, more current than Peterson, but both incorporate the major taxonomic splits of 2016. The older field guides don’t. You need to think about how important it is to you to know if you are looking at Blue-crowned Motmot or one of the two Central American species (out of five) split off from that species in 2016. Quality and organization of artwork are also major considerations. Gallardo’s Honduras guide is old-school, with plates separate from descriptive text. Illustrations are by three different artists. Peterson, Costa Rica, and Panama all share Robert Dean as chief illustrator. Dean’s style is crisp, precise, and deeply colored. Dyer’s images are painterly, delicately shaded, and delicately colored. The preferences here are personal–which style is easier to study, which images best display critical identification features, which illustrations bring you joy? Birds of Central America: Belize, Guatemala, Honduras, El Salvador, Nicaragua, Costa Rican, and Panama is a field/identification guide by Andrew C. Vallely and Dale Dyer, two museum-based ornithologists, that sets a high bar for quality of information and illustration and creates a good case for studying birds by geographic, not political, boundaries. I’ve discussed two reservations about the guide–the visual tonal quality and the Motmot map error–but these should not detract from the guide’s overall excellence. Its contents are a synthesis of over 600 articles on Neotropical birds. The illustrations of 1194 species in representative plumages are based on the study of species in the field and skins in museums; illustration design is carefully thought out and uniform. The book’s weight makes it really more of an identification guide than a field guide, but the other side of that weight is that we get nicely sized images, a font that is small but distinct and highly readable, quality paper that will last, and a durable flexi-cover. Experienced birders may remember a time when there were only three books on the birds of Central America, none of them field guides, none covering the whole isthmus. It’s good to have choices! And, it’s good to have this beautiful book showing so many beautiful birds, which I hope most of you have seen or will see in the near future. *Of the birds cited above, Fiery Aracari, Long-tailed Silky-flycatcher, and the hummers are all endemics; the Resplendent Quetzal and Turquoise-browed Motmot are also found in southern Mexico. Viewing this from Ecuador, I’m wistful to hold this field guide in my hand and appreciate what’s shared on each page. Thank you for this review!